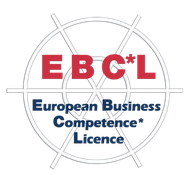 The European Business Competence* Licence, EBC*L is established internationally as the standard of education in business administration. It offers, with its three levels A, B and C, the possibility to prove exactly the practice-relevant economical core knowledge which is necessary in economic life. Renowned enterprises like ABB, Bayer Leverkusen, EDEKA Hamburg, EVONIK, VW Wolfsburg, Trenkwalder, Uniqa, Siemens and many more have integrated EBC*L into their career programme and so the certificate enhances your career chances. 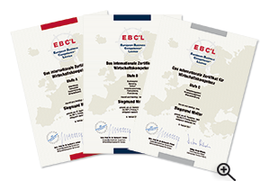 At the moment the EBC*L examination can be done in more than 25 countries and in 21 languages. „EBC*L does not offer a merely theoretical knowledge but involves exactly the subjects I need for my actual daily work." The EU Commission, Directorate-General for education and culture (Lifelong learning programmes) as well as the Directorate-General for enterprises and industry (CIP programme to enhance entrepreneurship) support EBC*L as a best practice showcase for entrepreneurship. 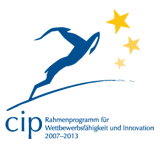 EBC*L preparation courses and examinations can only be done at accredited EBC*L training and exam centres providing best quality standards and targeted preparation.